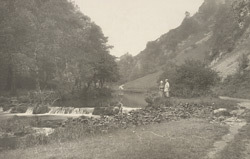 "Mr. A. T. Newington (Ticehurst) was awarded First Prize for his admirable photograph, 'Lovers' Walk, Dovedale,' which is reproduced as the frontispiece to this number of the Reporter. The Woodbury Company have succeeded in rendering with considerable faithfulness the brilliancy of detail and the half-tones of the original photograph. Mr. Newington says of the spot: 'It is but one of the many charming views to be found in Dovedale; it is about a mile and a half from Mill Dale. In taking this photograph I have attempted to add an interest to the picture by introducing two figures in such a way as not to be so prominent as to divert the atention from the landscape. They have left the beaten track to wander by the river-side - the peaceful scene lending its soothing influence as they pour forth the oft-repeated tale. The youth looks confident, the maiden coy, though not indifferent to the voice of the charmer.'"